I had high hopes for this one. 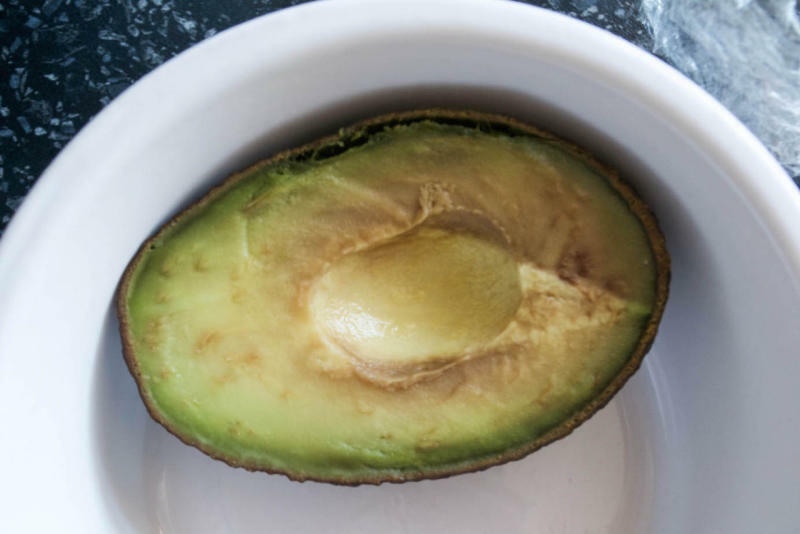 It’s how I store avocado halves at home and was pretty convinced - smug, even - that it would work well compared to the other methods. 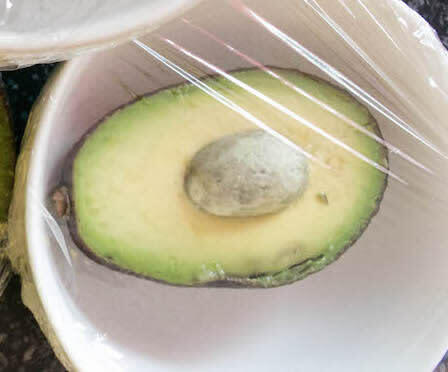 Wrap the cut half of the avocado tightly in cling film, making sure to press out any air bubbles and stick it in the fridge until you need it. If your half doesn’t have the pit in, smooth the cling up against the space in the centre, to help block out any air, which is what makes it turn brown. We left it in the fridge, in its little cling-film cocoon, for 24 hours, and then took it out and unravelled it. Hmm. Not bad, but it wouldn’t look particularly delicious in a salad, either. And the cling film had left weird little tramlines all over it. But it was OK. Guac with dinner it is, then. Rating: 7/10. 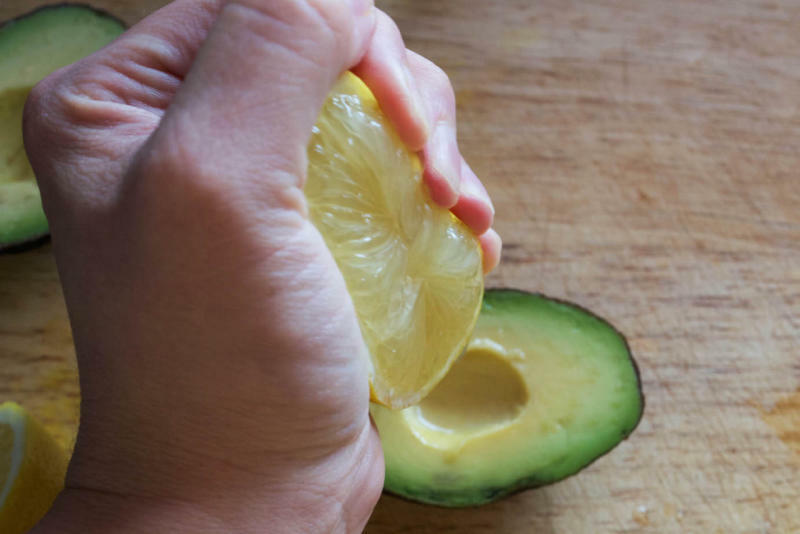 The idea behind this one is to coat the exposed avocado flesh with a liberal squeeze of lemon, as it’s less likely to brown straight away when in contact with something acidic. 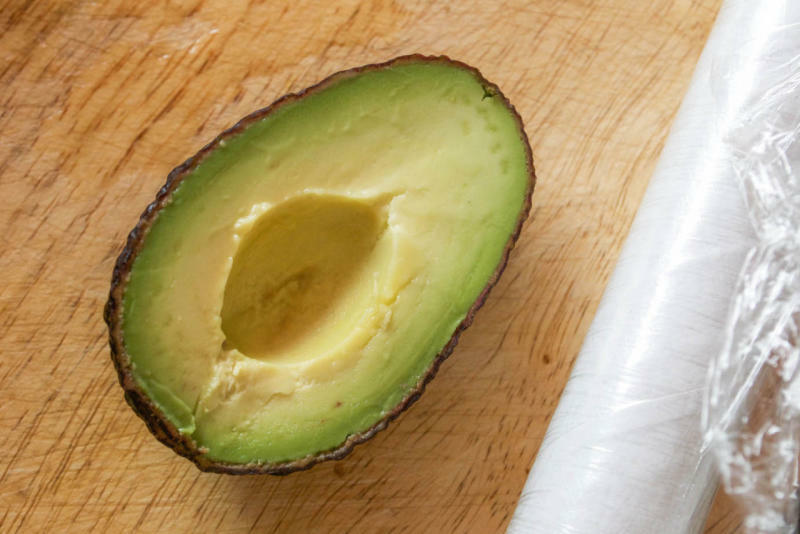 This Lifehacker post shows you how to use a cut slice of lemon to cover the avocado, instead, which helps seal some of the air out too. I squeezed over the lemon juice and placed it in a bowl, covering with cling film and refrigerating, and checked on it the next day. So, the space where the stone was isn’t too bad, which was probably where most of the lemon juice pooled, but it wasn’t quite the look I was going for. Rating: 5/10. I just had no hopes for this, whatsoever. 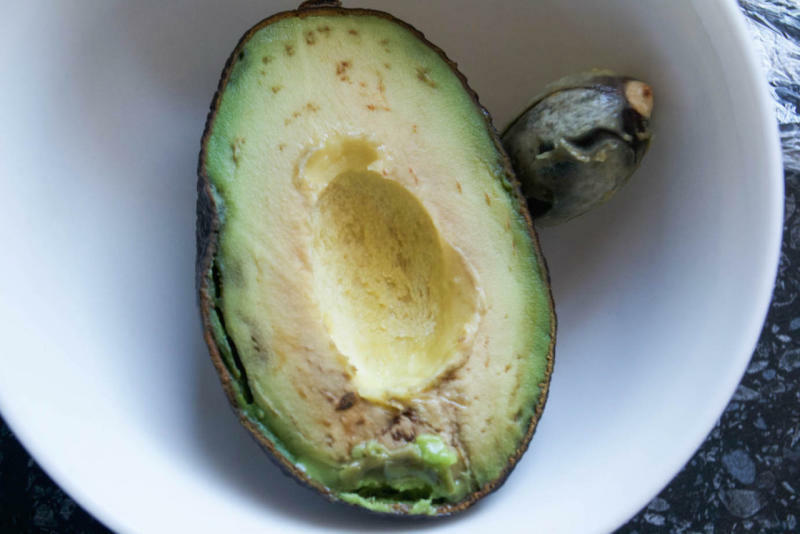 The internet is alive with claims that if you just leave the pit of the avocado in the centre, somehow the rest of the avocado will stay magically green. There’s no protection from the air, and no chemical reaction (that we know of) that will do it. But still, I chucked it in a bowl, covered with some wrap to give it a fighting chance and left it in the fridge. Yep. So this didn’t work. And this was after just 24 hours. The flesh had ripened really quickly, making it much softer - and pretty difficult to prise out the stone - and the surface had gone quite a lot browner. But hey, the bit where the stone was had stayed pretty green. Rating: 3/10. What do you mean, you’ve never heard of the Onion Trick before? Well, to be honest, neither had I, until I saw a video by Chowhound, which swears by it. 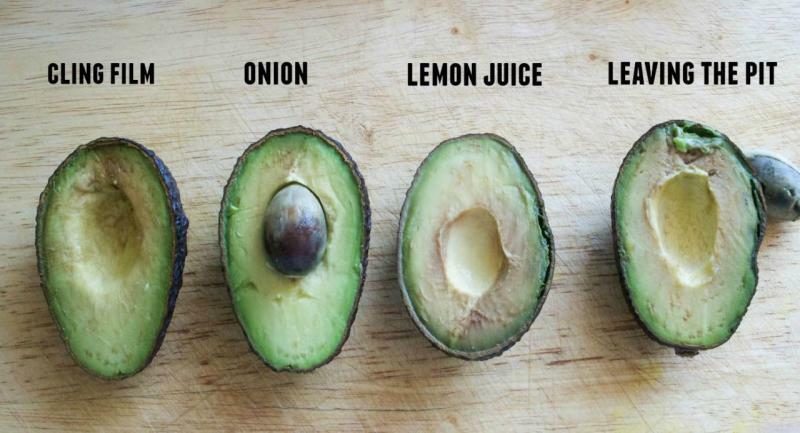 So I get that onion is acidic, but surely it wouldn’t work better than the lemon? 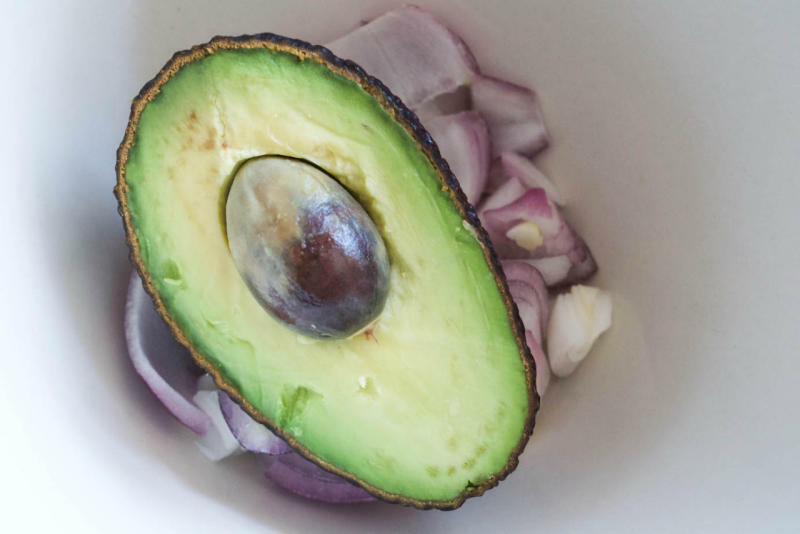 I placed the avocado, cut side down, on top of chopped red onion, covered it and slid it into the fridge. And, to be honest, didn’t think it would work. People, onion is MAGIC. 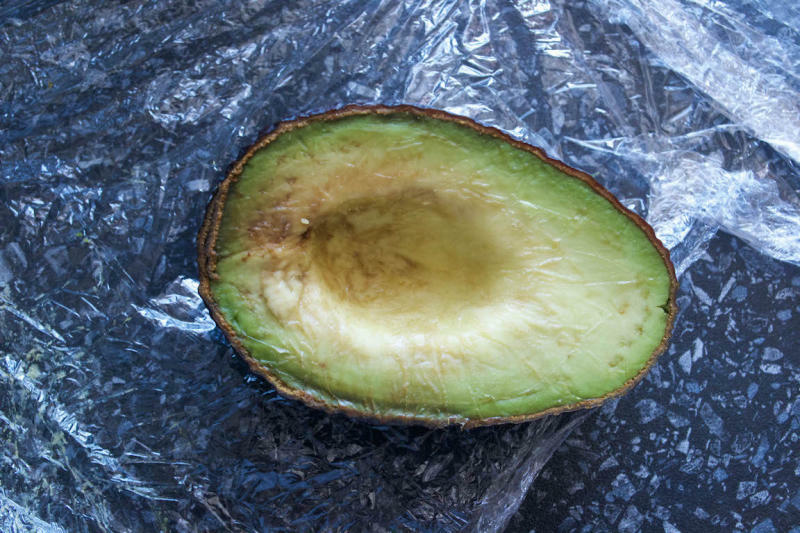 The avocado was pretty much as green as it was when it went in the fridge. Yes, there were some onion dents in it and it tasted a bit onion-ish but is that really bad? I don’t think so. Rating” 10/10. 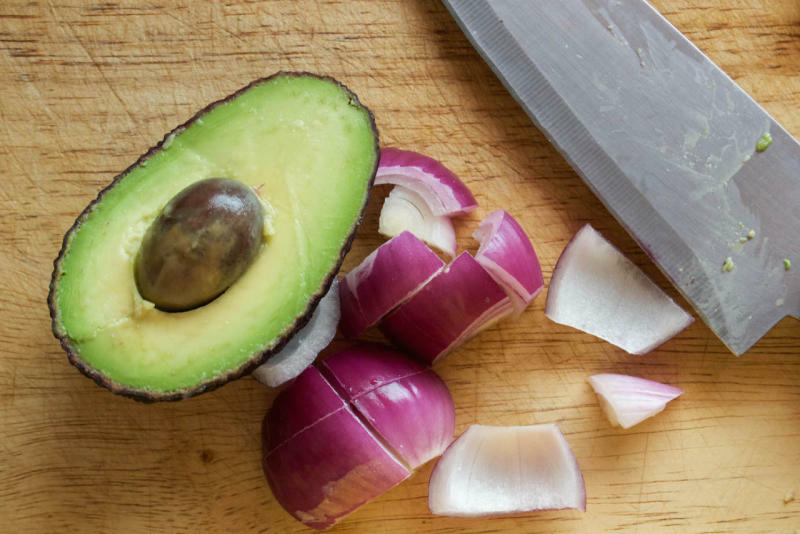 So far, we haven’t been able to get to the bottom of why onion keeps your avocado greener. Maybe it’s to do with the gases coming from the onion. Or maybe it’s just magic.